Spectacular and extravagant, in a breathtaking, unheard of design, the lusso is built upon alternate layers of aluminium and black acrylic, including the topsy-turvy cone for the aluminium platter fitted with an acrylic plattermat! The lusso is driven by a newly developed, extremely precise high-end synchronous motor suspended within one of the cones. The cones, not connected to each other, embrace height-adjustable feet that serve for perfect set-up. 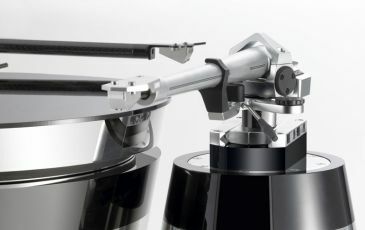 Even the carbon tonearm, mounted on a cone, demonstrates high style. Sonically, the lusso carries you into a perfect world of sound: Between precise, crystal-line highs and weighty bass is a generous, softly melting midrange that helps produce an ideal, musically balanced turntable.